Bounce To Disk is the way in which either entire mixes or parts of a mix can be mixed down to a file using the internal mix engine in Pro Tools. In the ‘good old days’ of audio production whenever a track needed to be mixed then it would be sent as an analogue audio signal to another machine, or to another track on the same machine. In the very early days before multitrack recorders this would be playing off one machine, adding a live performance, and mixing them together onto another machine and then doing it over and over until it was finished. Then as multitrack machines came along, once you had used 3 of the 4 tracks, to add more tracks, you had to mix those first 3 tracks down and record it onto the 4th track so that you could free up the first 3 tracks to record more material and so on. As multitracks expanded the need for more tracks always out stripped the tracks available so that the practice continued through into the digital world with machines like the Tascam DA88 and Alesis ADAT. Then there was the final bounce to a separate stereo machine to make the final master, first in analog and then digital. As technology developed DAWs began to offer the option to do all of these options within the box including creating a final master file for either manufacture or more recently for digital distribution on the internet. There are various names for this process, in Pro Tools it is called Bounce To Disk, in other DAWs it is sometimes called render to disk. Bounce to disk reduces the need for any external equipment to be needed when creating a final master audio file or to create additional stems. In Pro Tools versions 10 and below Bounce to Disk is an online (real-time) process meaning that any bouncing of the audio takes the time of the entire length of the song or audio marked on the timeline. Offline Bounce was introduced in Pro Tools 11 offering faster than real-time bouncing of the audio, this is normally a faster than real-time process but the time taken is determined by the complexity of the session and the plug-ins used. 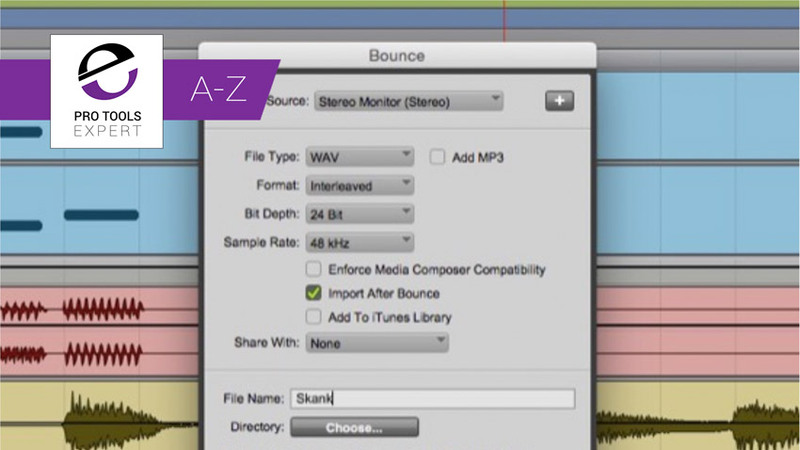 The first use for bouncing audio is as already outlined, to complete a final stereo or surround mix of the audio. Bouncing can also be used for creating separate audio stems, for example when delivering a set of different mix components for film and TV. The final use for bouncing audio to create audio versions of complex tracks and to free up system resources, this is often referred to as track freezing. However track freezing in Pro Tools is achieved by using offline bounce as a work around. This is where instead of using the Bounce To Disk option, you configure the mixer so that you record your mix to a set of tracks within the session, mirroring the way the early multitrack machines were used. You could do it with the final mix or use it to create all your stems in one pass, but even with Pro Tools 11 bouncing to track is a real time process, however it does give you the option to audition the mix one more time and making changes can be achieved quickly by dropping in on the bounce track having tweaked the mix for just the section that needs fixing. You don’t need to rebounce the whole project. In Pro Tools HD software Pro Tools can create multiple files from different sources allowing the creation of stems, or multi track freezes in a single pass. Offline bounce is limited to a single stereo track in native Pro Tools software. Offline bounce can be a huge time saver on large projects and was one of the most requested features for Pro Tools. Whilst offline bounce can save the user time most professionals would check an audio file before sending it out as the final master, of course this can only be done in real time which defeats the object of rendering it in faster than real-time. However on balance the addition of offline bounce is a feature that brings great benefits to Pro Tools users.